As I explained in my blog about Hypothes.is, a fundamental problem skeptics face on the Internet is one of attention. How can we get those who are reading bad information about science to also read better information which debunks it? We can do our best to make our sites as visible as possible via Google and other mechanisms, but there’s no really obvious way to lead someone directly from an erroneous piece of information to its debunking. RBUTR provides such a mechanism. It creates a way to build links between articles and their rebuttals, without the permission or cooperation of either author or site. Like the other project, it will enlist the help of the general public (through crowd-sourcing) to create these links. That means you, skeptics. Unlike the sentence-level annotation promised by Hypothes.is, RBUTR works entirely on a page level. That makes it considerably simpler, and easier to understand. The authors of RBUTR make that and some interesting points about how it might succeed where others have failed in a blog post. I admire their enthusiasm. As I’ve said before, I’ve long wanted to build a tool very much like RBUTR. Among the issues that slowed me down was a worry that the tool might be misused to advance non-scientific information. How do you ensure that, for instance, creationists won’t use RBUTR to advance their own agendas? The authors have an optimistic response to that objection. I’m not sure I share their optimism, but I admire it too. There are other technical challenges ahead for RBUTR. One that I encountered in my own development efforts is the URL canonicalization problem. You can read that post to learn more, but basically a single piece of content can appear at many URLs. How do you correctly link up a rebuttal when that is true? The problem gets far worse when you think about content which is serialized to multiple sites, such as wire service news stories. I’m encouraged that the authors of RBUTR are talking about these problems during their beta test, it shows that they are thinking through the issues and not just ignoring them. Skeptics should give them support and input during this critical phase. Right now RBUTR is only available as a plug-in which works with Google’s Chrome web browser. Eventually the authors plan to port their product to the other major web browsers such as Firefox, but it makes sense to concentrate their efforts in one place for now. Once you install it, it appears as a button to the right of the URL in your browser. Here’s the top of my copy of Chrome, you can see the RBUTR icon (an “R” in a green circle) right next to the icons for Fishbarrel and Web of Trust (two other browser extensions we’ve talked about here). 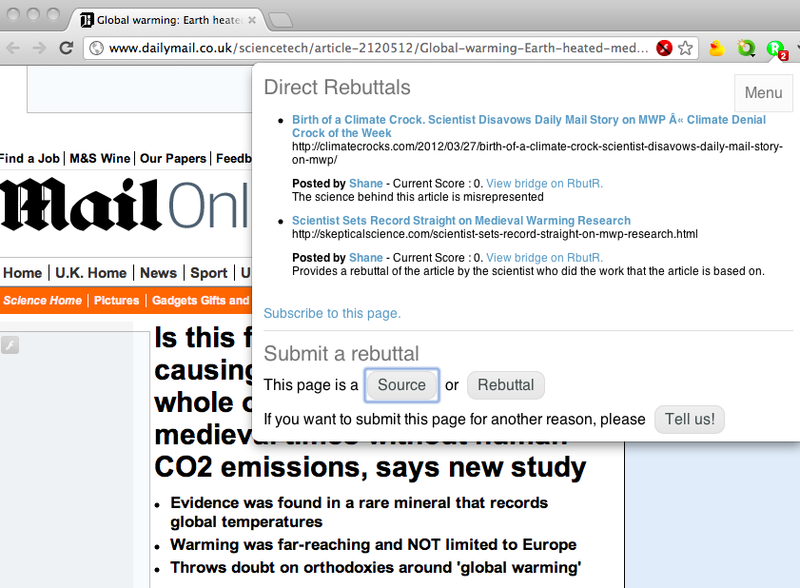 Here you can see not one but two rebuttals entered for a poorly written article about climate change in (surprise!) the Daily Mail. You can click through to see the rebuttals or you can submit your own to add to the list. Each rebuttal has a short explanation of what aspect of the original it addresses. Of course, the tool can only help those who bother to install it. But for those folks who are willing to consider opposing views, this could be a valuable way to bring skeptical material to their attention. If you use Chrome as your browser (or are willing to switch to it) sign up for the RBUTR beta and start entering rebuttal links. Skeptic bloggers should enter their own articles (as appropriate) into the system. It’s not hard to install Chrome if needed. Give the authors feedback on the product. It’s not quite there yet, but once it has achieved a bit of a critical mass, I would also encourage you to install the plug-in on the browsers of family members and friends to help them find skeptical and critical material. Congratulations to Shane Greenup and Craig O’Shannessy for getting RBUTR off the ground. I wish them success. Thanks for posting Tim, we really appreciate it. It communicated the philosophy of why I invite intellectual conflict, but I think the power of the rbutr idea in this venue, is that it creates a semi-permanent, semi-static, evolving Debate. So think of a classical debate. Three people for each side, each has a few minutes to present their arguments, and at the end you have to pick a side. Horrible horrible way to resolve anything, but for some reason it has persisted for a very long time now. Now think of rbutr as a similar concept, but instead of picking your 6 people in advance, you pick one person randomly to make the opening argument. The next speaker is then no picked at all, but instead 100 people write rebuttals to the opening argument, and a community filters these arguments for quality, voting the best up, and the worst down. With enough interaction, the ‘best’ (available) arguments reaches the top of the list, and is presented as the rebuttal. The third ‘debater’, the second argument from team 1, will then of course follow exactly the same process – again, not being picked in advanced, but instead having the best available counter-argument selected from a pool of attempted rebuttals. Now in this process, just like a real debate, there is no need to control the side you disagree with, or fear that they will abuse the system. In fact, within the philosophical principle of charity, you really really want the other side to make the BEST argument that they can make. The thing which makes the rbutr ‘debate’ soooo very infinitely better than the live debate format, is that the responses cannot fairly get away with ignore key points, or omitting difficult facts etc. text based arguments can be studied and re-read multiple times so that well formulated rebuttals can be made. And with this sorting process of finding the ‘best’ rebuttal to each previous argument, hopefully the best rebuttals will always address every major point. And whenever they don’t, then the counter-counter point should definitely make a point of reminding the author that they omitted an important argument from their rebuttal.